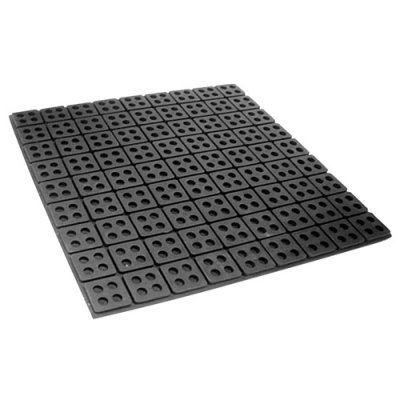 Vibrasystems Inc. ECRMP Pad is one of the most efficient and versatile Pads on the market. The anti-skid design with its suction cup eliminates the need for bolting down. The primary vibration absorption material is Neoprene for moderate oil resistance. The 2" squares are separated by a thin web that is easily cut. 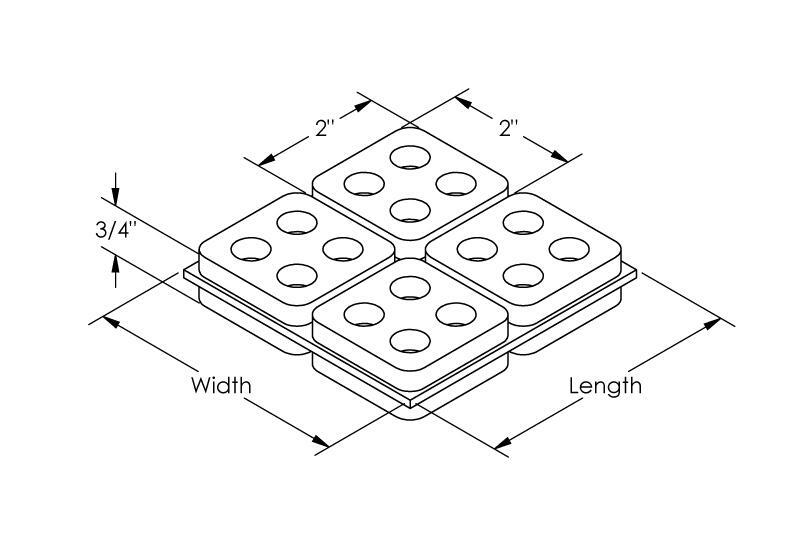 For application where greater isolation efficiency is required ECRMP Pads could be glued with steel plates in the middle to create blocks/shims. Recommended for: The ECRMP Pad is suitable for applications where bolting is to be avoided and minor non-critical vibration conditions exist. It is also recommended for HVAC, motors, pumps, generators, air conditioning units, chillers, machine shop machines, etc. Anti-skid surfaces through suction cup construction. Can be reused when machines are relocated. Reduce noise and minor vibrations. Easy-cut design allows flexibility of Pad size. ECRMP 0202 2" x 2" x 3/4"
ECRMP 0404 4" x 4" x 3/4"
ECRMP 0606 6"x 6" x 3/4"
ECRMP 1212 12" x 12" x 3/4"
ECRMP 1818 18" x 18" x 3/4"
The standard size is 18" x 18". Cut sizes are also available. ECRMP Pads should be used in full squares. Working range: 50 to 120 psi. Maximum Load capacity: 150 psi. 20% Deflection at Maximum Load. We can mold it from other types of rubber material based on the customer's specifications.